"Live" performance of clapping, singing seniors. Heighten client comfort and sense of connection. Lyrics appear on the screen. Includes a large print songbook on CD-ROM. 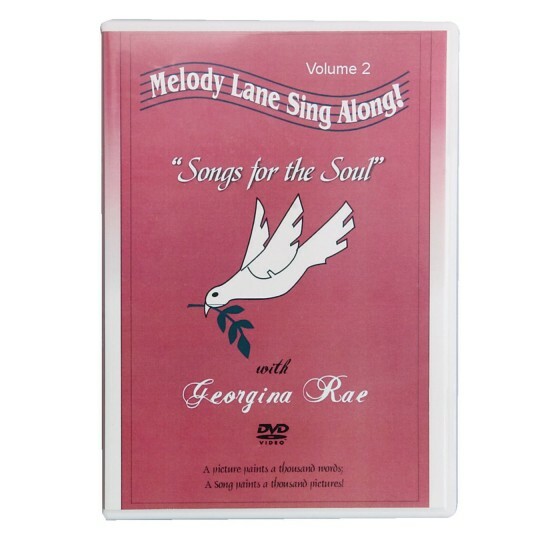 A popular resource for long term care, retirement and adult day programs, this soul-stirring sing-along DVD includes "When the Saints Go Marching In," "Over the Rainbow," "This Little Light of Mine," "How Great Thou Art" and more. Features a professional "live" performance with an audience of seniors singing and clapping along to enhance your client's comfort and feeling of connection. Words appear on screen. Includes a large print, colorfully illustrated songbook on CD-ROM that is ready to be duplicated - print out as many song sheets as you need for your group! Endorsed by Creative Forecasting, Alzheimer Society of London and Middlesex, and Video Librarian. Running time: 45 minutes. Royalty rights have been paid to include newer material. Melody Lane Sing-Along DVDs are the choice of thousands of activity directors who want the best in upbeat karaoke-style sing-along DVDs for clients of various abilities.